I've been a member for a few weeks but finally picked up my bike from the dealer today and thought maybe it's time for introduction. So, the bike is a Black -08 with Laser Extreme slip-ons, powercommander + few other treats. My previous bike was a Triumph Street Triple (ridiculously agile and brilliant chassis) and I was a bit concerned how the bigger King feels because I bought it without ever riding one. I just knew it was the bike I wanted. Based on todays ride the B-King didn't disappoint. Great bike. I think I'll get adjustable pegs but otherwise no complaints. Delighted to see another with Laser Exhausts - I think they are the best! Welcome. 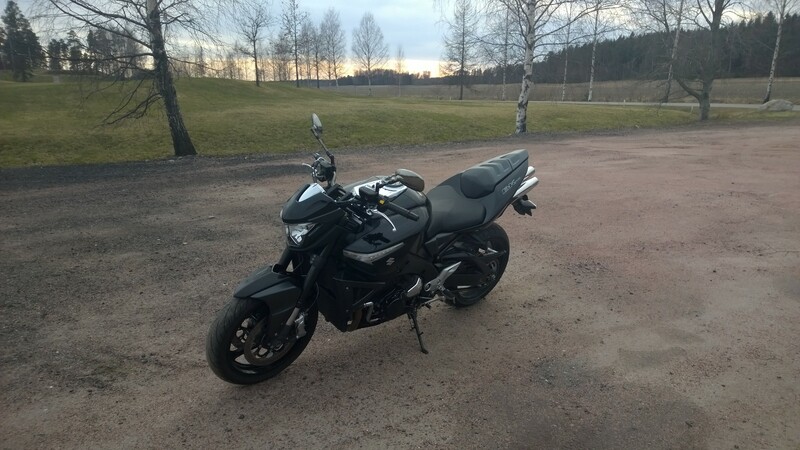 I am the same, in that I bought without riding first, but I was also really attracted to the aggressive style, the upright position, the naked style, and of course, the power.